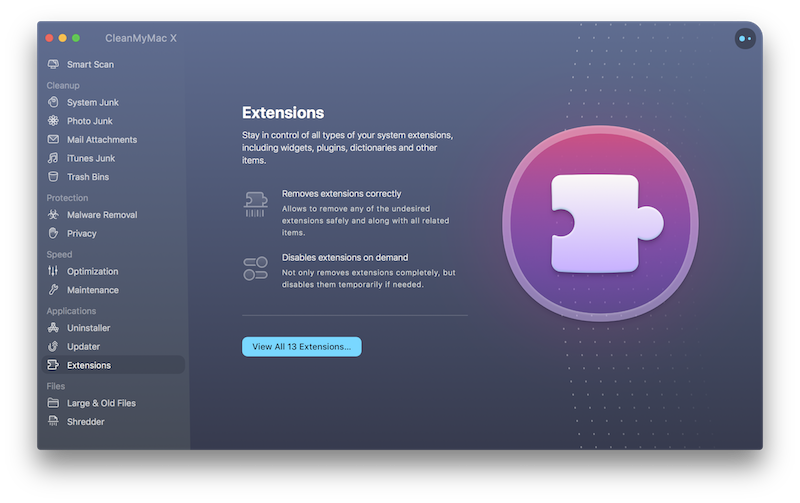 The Extensions module shows you plugins, widgets, preference panes, and other supporting services installed on your Mac. These “little helpers” are usually quite useful, but some of them may annoy you, especially those installed automatically along with a bigger app. Safari Extensions: various plugins and add-ons that expand Safari's capabilities. Preferences Panes: custom preference panes that are built into System Preferences after installation of some apps. Internet Plugins: add-ons of browsers and networking apps. Spotlight Plugins: all extensions of the Spotlight search tool. Click the appropriate extension group in the right-side pane. Select a checkbox next to every item you want to remove. Please remember, there's no way to undo the removal. You'll need to install deleted extensions once again if you need them.